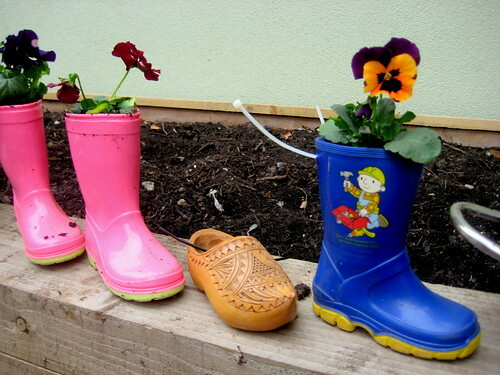 This week’s school gardening club motto was ‘how cool is that!’ When the children arrived for the club I don’t think they really believed us when we said we were going to plant flowers in wellington boots – but that’s just what we did. The aim of the school garden is to be as eco-friendly as we can while still creating a beautiful space. 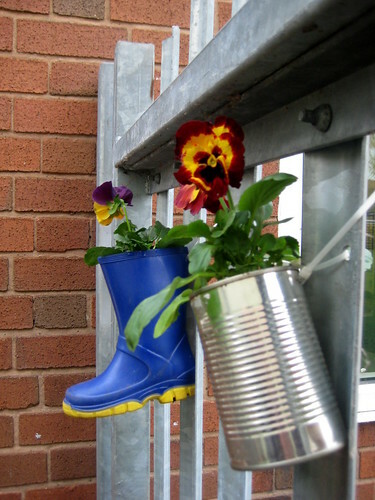 Inspired by the wellies, teapots and bottles I’d pinned onto our Kids Gardens Pinterest board we set about gathering some quirky eco planters to create our own wall of colour. The plan was to re-use and upcycle what we already had, were about to throw out or could find in charity shops. And it’s amazing just what you can find to transform into a plant pot! First we made sure every planter we were going to use had drainage holes in the bottom. Scissors or a craft knife did the job well in most of the containers and we used a drill for some of the metal items. 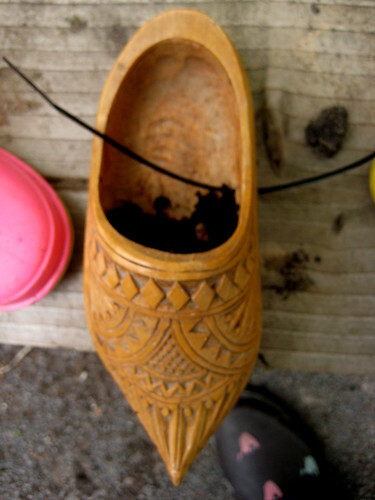 And of course some planters, like the steamer and colander, came with drainage holes already in them. We used cable ties to fasten the planters to our fence, with some ribbon here and there to add some extra colour. 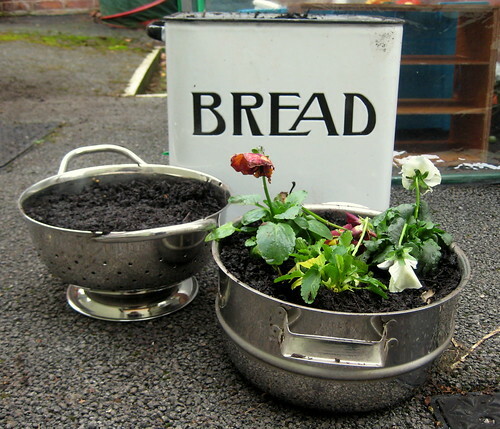 The eco planters were filled peat-free compost and a selection of spring bulbs including snowdrops, daffodils and tulips, with some winter pansies to add colour over the next few months. The children just loved how great the wellies looked. We also made some planters to group together on the floor, using kitchen items to tie in the idea that we’ll be eating lots of the things we’ll be growing. The eco planters have already transformed the drab metal fence that makes up one wall of our school gardening club plot. This fence is visible from the main entrance to the school, giving a little glimpse of the secret garden it hides. Imagine how glorious it’ll look when all the bulbs are in flower. Love it- really creating outside the box! so much fun, thanks so much for sharing on Craft Schooling Sunday. 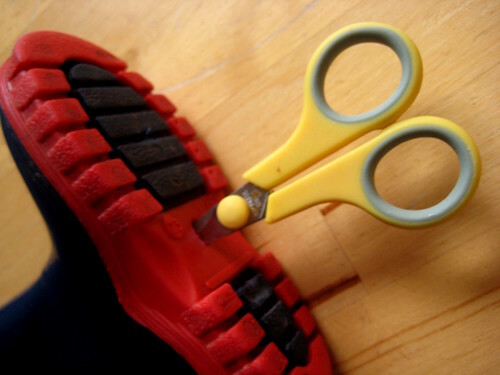 My eight year old pointed out that his fireman rainboots have a hole in them alack alas, guess will just have to buy him some new ones and use those for plants….yippee! Love this idea! What fun. And I can imagine that older kids would have a blast working with their parents on what they could find around their house that they could turn into a planter. Thanks so much for linking this up with the outdoor play party! This is terrific, anything that gets kids into recycling and gardening gets the thumbs up from us. 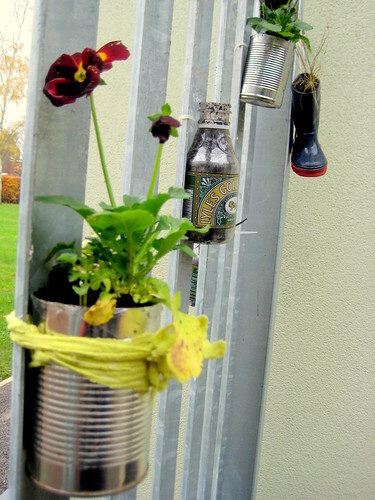 Another lovely idea for Spring is to make bird feeders from recycled objects, for example old plant pots and cups. how, I adore your planters! they are so fun – I would love a whole garden of these quirky/alternative planters.